Yesterday after I put on my shades by Barielle "A Bouquet for Ana" I kept thinking that I had another color that looked just like it. So I got on the floor (my polish spinners got knocked down there since I needed the side tables for well, side table purposes again) and started looking. Finally I figured it out. China Glaze Shower Together. So I removed a bit of polish and did a little comparison. The bottle in sunlight made me really feel that these were dupes. On however, was a different story. If you remember, A Bouquet for Ana was 2 coats (one thin and one thick). 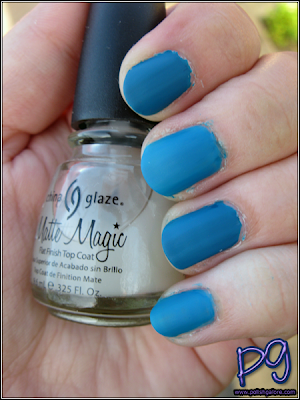 Shower Together was also 2 coats but in China Glaze fashion, it was two thin coats, no pooling into the cuticles. 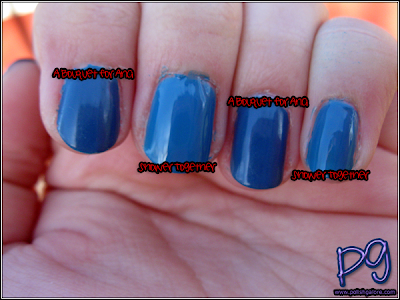 I used Seche Natural for the base coat and Seche Vite for my top coat. You can start to see in the shade that this is not a dupe, but rather, cousins. A Bouquet for Ana (on my index and ring finger) is slightly darker than Shower Together (shown on the middle and pinkie fingers). Thanks for reading! I was able to grab a little bit of sun for my next manicure - it's one of my absolute favorites - the second polish I wore when I started collecting again! Great comparison of two beautiful blues. I don't have either one...but I think I like ABFA a little better. They're both beautiful blues, even if they are similar. Thanks for showing them matte, because for some reason it's hard to tell the difference in shades in glossy finishes sometimes.